Everyone, even the big kids, loves the Santa press conference. I’ve been to many, many yearbook workshops over the past 15 years. Often, a workshop will open with “what is a yearbook?” Sometimes, a workshop will close with a commitment ceremony or something similarly stirring that inspires students to go out there and create the best yearbook they can for their school. Author Pat Conroy wrote, “A yearbook is a love letter a school writes to itself.” I carry a tattered and torn copy of these words with me everywhere I go. There are two things that “a yearbook is” that give me my greatest enjoyment in high school yearbook journalism. A yearbook is a history book. When my staff hears the first comments students have to say about their yearbooks and when faculty members come up and say to my staff members, “Wow, you have so many stories in here!” it makes me smile and tear up. I get a little lump in my throat. I love seeing my students puff up with pride. We have captured the year, for better, for worse. To oversee a group of students led by a student editor make the decisions of how to tell these stories is a blessing to me. That day when we open the boxes I watch as my staff members get all quiet checking out their pages at first. Then they start exclaiming, “I helped do that page!” and “I had forgotten about that story I wrote!” Those are magic moments. My yearbook students not only report on things that happen at our school and in our community, they also help make magic happen. 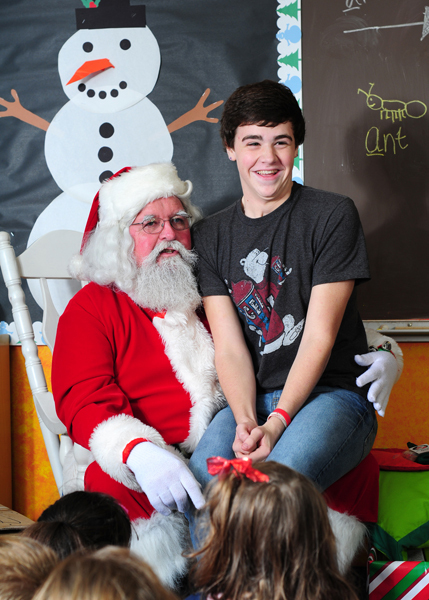 Magic happened when my students arranged a press conference with Santa Claus last December. With the help of our local newspaper editor, they arranged for two kindergarten classes from the elementary school next door to come visit Santa and ask him questions. To break the ice, my students prepared questions as well. It’s a good thing, because the kindergarteners were too awestruck to say very much! As Santa told us his favorite type of cookie (oatmeal), and how exactly he manages to get to all those houses in one night (magic, of course), there was not a single person in the room who wanted that magical day to end. We have hundreds of photos from when the kindergarteners each received a toy truck or a doll from Santa, which had been provided by the local police department. Santa read his favorite story, ‘Twas the Night before Christmas, and every “kid” had an opportunity to sit on his lap. We were part of that magic, and we all felt it in our hearts. In 2012, the Dunnellon Police Department was able to help us by providing a doll or truck for each child. 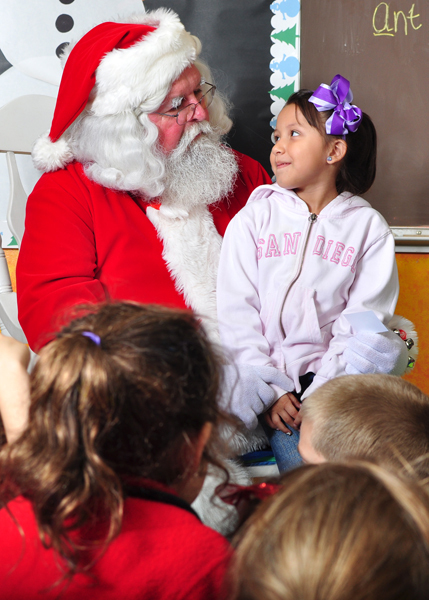 The kindergarten students gazed at Santa in wide-eyed wonder. My high school yearbook is magic to me. I know exactly where I am in it, even if the image is blurry or I am in the background. I remember the canned food drive that my club organized for Thanksgiving. I remember how stressed out I was when we discovered that one of the teachers had broken into another teacher’s room and stolen the cans! How were we going to decide which class won the breakfast? I remember all the back roads my friends and I drove as we delivered the boxes to needy families. There’s a story in the yearbook. Magic is made in every moment that is forever enshrined in the yearbook. Last year, right before school ended, I sent a yearbook staff member to deliver a yearbook that had been purchased anonymously for a student. The student was so excited to receive it he came to me as soon as he could and asked to know who had given him the book. He said he wanted to thank that person. I told him if he wrote the note I would make sure it got to the right person. Later that day, he came back by to drop off his thank you note. The young man probably had an idea which teacher it was who made the yearbook magic for him, and that magic will remain in his heart forever.The kindergarten students gazed at Santa in wide-eyed wonder. Sometimes when we are in the middle of deadlines we forget that we are making magic. Then, just when I start to wonder if it’s worth it, along comes another magical moment! My yearbook editor, Laura, has always been a great writer and designer. She is, however, a “non-photographer.” Or at least, she was. 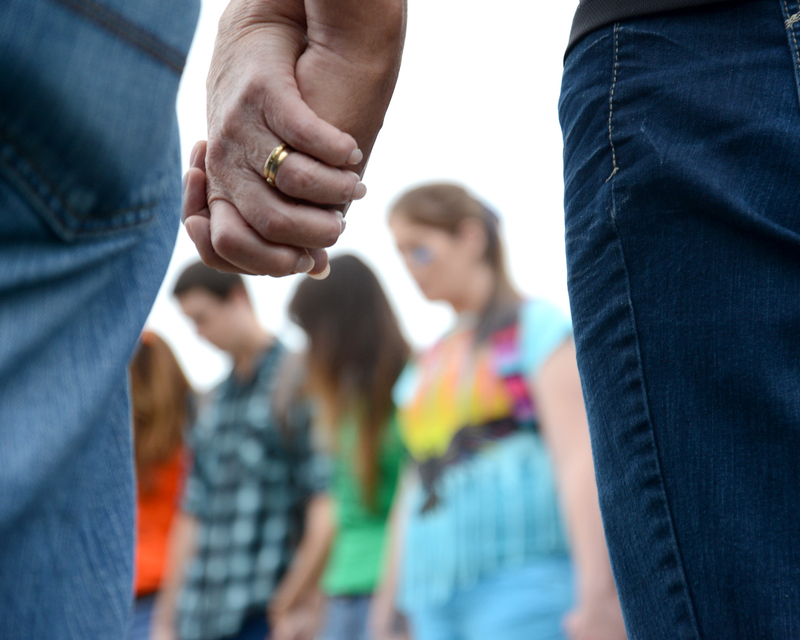 The other day, she picked up a camera and just blew us away with photos such as this one, of the See You at the Pole event at our school. Magic happens! Now I know that no matter how much I vocalize, I’m probably never going to run into Tom Petty in a smoky bar and sing a couple of songs with him. I don’t ever go into smoky bars! And I know most people find Nicolas Cage a little odd looking, but I think I could marry him if he asked. I’m probably not going to hit the lottery either. But that does not stop me from dreaming about how many houses I would be buying, and in what exotic faraway places. I have no musical skill, yet I still hope to learn to play the guitar; and I can barely walk half the time, but I still maybe someday could learn to balance on a surfboard. What I do know is that it does not hurt to have dreams. They keep you going. Verbalizing them is very important! I like think about the many things that people told me I could not do, and how many times I have proved others wrong. Yes, I did drive across the country in a very old car one year, breaking down three times along the way. Yet staying the course we were able to see nearly half of the States in 30 days, on a budget. The following year I drove to New England and broke down a few more times. Yet again, we got through it and saw what we wanted to see. I sold the car to my father after that, though. Lucky him, I had already replaced everything so he never had a single issue with it! Nobody ever told that car what it could and couldn’t do either. It defies all odds and still runs today. My son drives it. That car is older than my son! I don’t know many people who would not panic at the feats that somehow are achieved in my classroom. With two working computers and a lot of fundraising, we manage to produce a great yearbook every year for our school. I am sure you might have heard the expression “Raising teenagers is like nailing Jell-o to a tree.” This is a fairly adequate description, yet somehow I have a class full of teenagers who defy the odds and perform what is next to impossible every year. We are raising (and spending) about $35k. So, the reason that I’m telling you all of this? Because, guess what? Things really do work out. How this happens is, of course, a lot of planning. But there is no way that planning is everything. I believe that there is a little bit of fairy dust getting sprinkled in my classroom. Keep that in mind when you start doubting yourself! Nicolas Cage, I love you! Do you want to learn to surf together? I’m pretty sure that, while I consider myself to be creative, I’ve probably never had an idea that somebody else hadn’t thought of first. In terms of almost everything in the world (except maybe technology) there are no more original ideas. There are just reenactments of old ideas with a new generation as the audience. Movie themes… what’s new there? Fashion… how many times will we repeat plaid? Or bell bottoms? One of the most unique things I ever did was when I began to create customized photo collages for parents of athletes. Even this was not my original idea, though. A parent suggested it. It was truly a success for several years until a few other local photographers mastered Photoshop to enough of a degree that they could copy my idea. But the main point here is that it was not my idea in the first place! So since I’m no Steve Jobs, I’ll just continue to be as creative as possible and, when it comes to ideas, try and be on the front end of a trend. This is extremely important in the world of yearbooks. 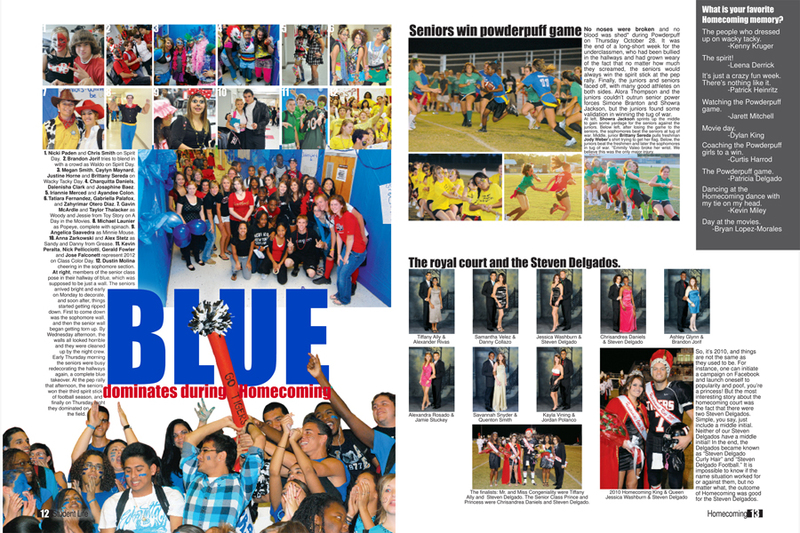 I want very much for our yearbook to look like the year during which it was produced. Nothing bugs me more than picking up a yearbook and wondering whether it was made in 1993 or 2013. “We’ve always” should NEVER be part of your vocabulary when you are planning your yearbook. I know you will get some flak from your administration if the design is a little too “out there.” But that book really needs to look like the year it is, and yes I know that students do not have the same level of First Amendment rights as the rest of us. Your administration needs to understand that this is not your grandma’s yearbook! 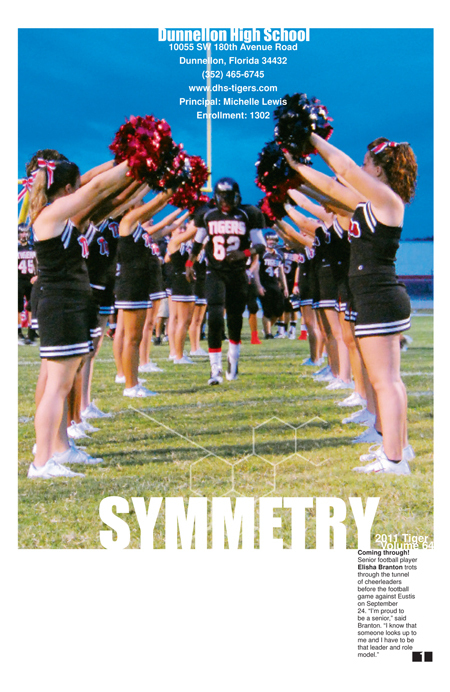 If your school is really in love with its school colors, it might be financially devastating to deviate from that on the yearbook cover. I think back to our mostly green cover in 2003. There are dozens of that book left in my closet at school! Our customers expect red and black. We can’t really change that much. But we have found that white and gray work, too. So as long as we have any of those four as the dominant color our books will sell. Can you guess which of these yearbooks did not sell at a school whose colors are red and black? Be very careful with your color choices! If you’re thinking of not putting the school colors on the cover, please, please, PLEASE make sure that you are very careful not to choose a color palette that even remotely resembles a rival school. Color is such a powerful thing. Do lots of research before choosing a palette. If “everybody” used a font or a design element in last year’s book, then don’t use it! It’s old! That’s what we did in 2008. We used a font that everybody used in 2007. It wasn’t that fun anymore. Speaking of fonts, there are some you should NEVER use. Consider them retired. Permanently. Never coming out of retirement. Comic Sans and Times New Roman are not allowed. Capisce? And please limit yourself to just one font family or just two fonts. Nothing says 1998 like a different font for every section of the yearbook. When you flip through your yearbook pages, the whole book should look like it is from the same school! Do your research when making font choices. Make sure that your one font is easy to read, and don’t make your captions so small that it takes a magnifying glass to read them. Some of the most gorgeous yearbooks I’ve seen in the past few years have had type that I cannot read. I need 8-point type. I understand that young eyes might be able to read 6-point type, but a yearbook is forever. So you’re going to need to make the type a little bigger for when your customers become less young and invincible! One of the best marketing lessons I ever learned was so very much by accident that I just really must tell you the whole story. I had just arrived at the hotel in Charlotte, North Carolina after a L-O-N-G bus ride from Florida that began at the crack of dawn. I was in Charlotte with a few yearbook students to tour the Charlotte Herff Jones yearbook plant. We had about an hour before we were leaving to go to dinner and I was so tired! I thought I would take a little cat nap. When I am in a hotel, I almost always find that the Weather Channel is a great sleep-inducer. That Allman Brothers song that they play as they are showing the weather radar across the country is just very soothing to me. (Weather Channel and Allman Brothers, please do not take offense). On this particular day, though, I never made it to the Weather Channel. I instead landed on PBS. At the time I had no idea what the name of the show was, but it seemed to be a kid’s show. And it was about marketing! Later I found out that the name of the show is Biz Kid$ (http://bizkids.com/show). I’ve watched many episodes since then, and many, many of the episodes provide valuable information that would benefit a yearbook staff. This particular episode on marketing focused on the four Ps of marketing: Product, Price, Placement and Promotion. To be honest, this is about all I really know about marketing. But it is also really about all anyone really NEEDS to know. 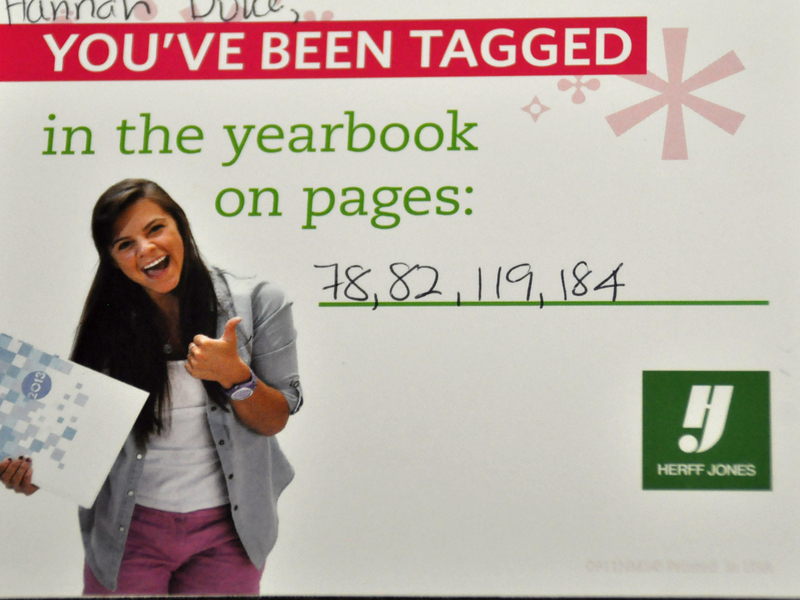 Product: Are you creating a yearbook your customers (the students) want to buy? If not, how can you make them want it? My answer to this is almost always coverage. Price: Is the yearbook priced right? When you offer it on sale, is the difference in price significant enough to make customers act? We offer a coupon at the beginning of the year. These days, people go crazy for coupons. We sell nearly ALL of our books during our coupon sale. Placement: Do your customers know where to go to buy the yearbook? Establish a location and always offer it at that location. Make sure your yearbook is visible throughout the school though. 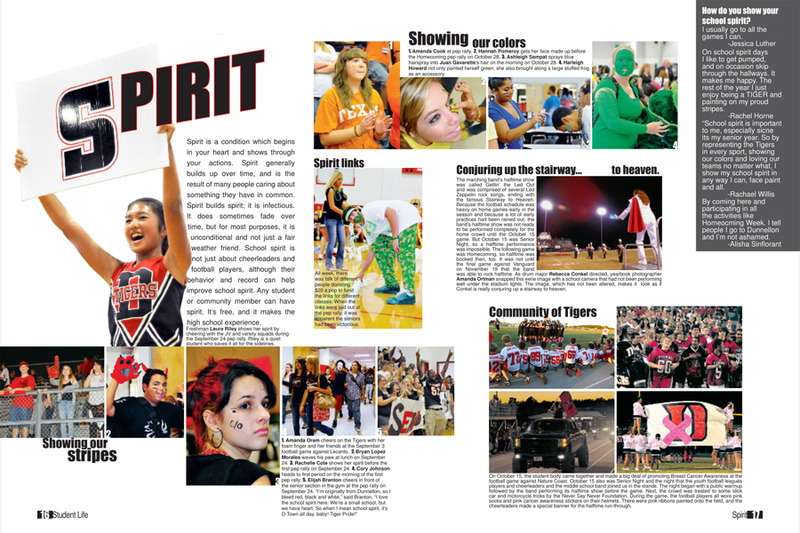 The best “place” for the yearbook to really be is in the minds of everyone, every day. Promotion: How are you letting your customers know about the yearbook? If you are only hanging signs, that is not enough. If you are only putting it on the morning announcements, that is not enough. Promote your yearbook everywhere you can. Make it visible, not only from the minute somebody walks onto your campus, but also in the community. Even if your staff is not allowed to have a Facebook, staff members can still post, Tweet and create a buzz on all the social media sites. After the yearbook is finished and we have compiled a complete index, We create a sign with the names of all the students who are in the book three or more time and have yet to purchase it. The sign gets a lot of attention in the hallway. A yearbook can’t be successful unless people know it exists. It can be full of the most gorgeous images and the most awe-inspiring writing and design. Market it! We then follow up with a postcard to let students know what pages they’re on. We are adding a coverage editor to our leadership group this year. 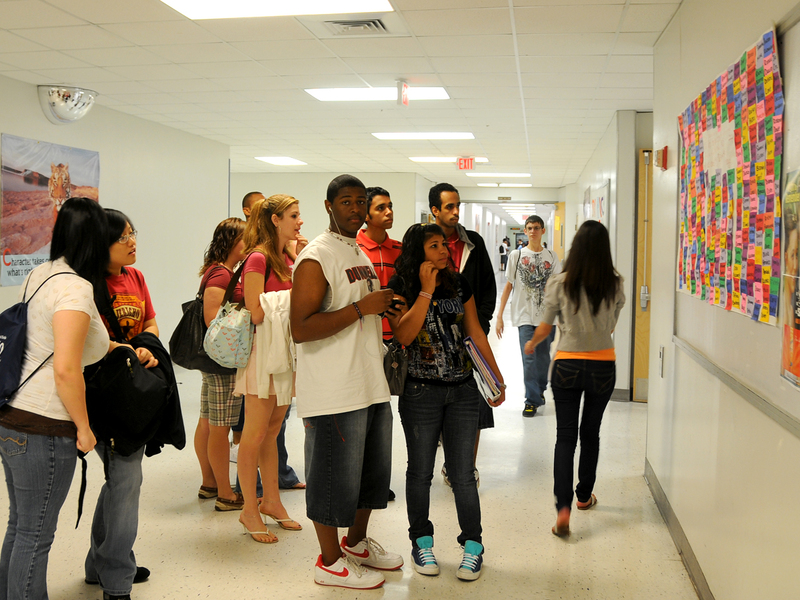 We will be surveying the entire school and calling students in for interviews. We will supervise as a “quote book” gets circulated among students who are tough customers when we try and get a story out of them. We will continue to think outside the box for unique stories. Do you always have a page in your student life section on cars students drive? What about the ones who don’t drive? Do you have walkers, bicyclers, motorcyclers, bus riders? Find ways to tell their stories. Who has the longest bus ride to school? I bet that student isn’t in very many clubs or sports! His parents aren’t going to drive all that way to pick him up after practice. How can you incorporate birthdays into your coverage? Who was born on a holiday? What is the most popular birth date on campus? Are you doing a page on students’ favorite restaurants? This may also limit you to only covering students who are able to drive. What about a page on pizza instead? Almost everybody likes pizza. What’s everyone’s favorite pizza joint? Favorite topping? Weekly pizza intake? Who can’t eat pizza due to gluten or lactose intolerance? Go out and find these stories and more. Think outside the box when you plan your pages. Ask yourself, “Is this page topic going to leave people out?” If it does, change it! Coverage is the single most important marketing tool. It is the most important job of the yearbook staff. If a student is in the book, then he or she will want to buy the book. We began to really make an effort to cover everyone in our 2011 yearbook. Even on the first page, we got lots of people! A few years back, a yearbook adviser contacted me about her concerns about being able to pay her bill at the end of the year. It seems that, with just a few weeks to go, she still had quite a lot of money she has to raise. “How much?” I asked. “Oh, about $8,000,” she answered. As a yearbook adviser for 15 years, there have been some tough years, but NEVER should you get within weeks of the end of the year with that much debt to tackle. There are a million ways to be successful with your yearbook marketing. I’m a firm believer in NOT doing any fundraiser that does not directly relate to the class objectives. In other words, no candy sales, bake sales or car washes. Just book sales, ad sales and photography. You must cover EVERYONE in that yearbook. Over the 15 years I’ve advised, our school has grown from about 850 students to 1500 and then back down to 1100. When I first started advising, digital photography had not yet taken the world by storm. If a student wanted to remember the school year, that student needed a yearbook. Somehow we managed to get just about everybody into the book without even trying. I guess it’s not that hard with 850 students and 200-some pages. Do the math. That’s just four or five students per page. We attempted to get one “group”-type image on each page. 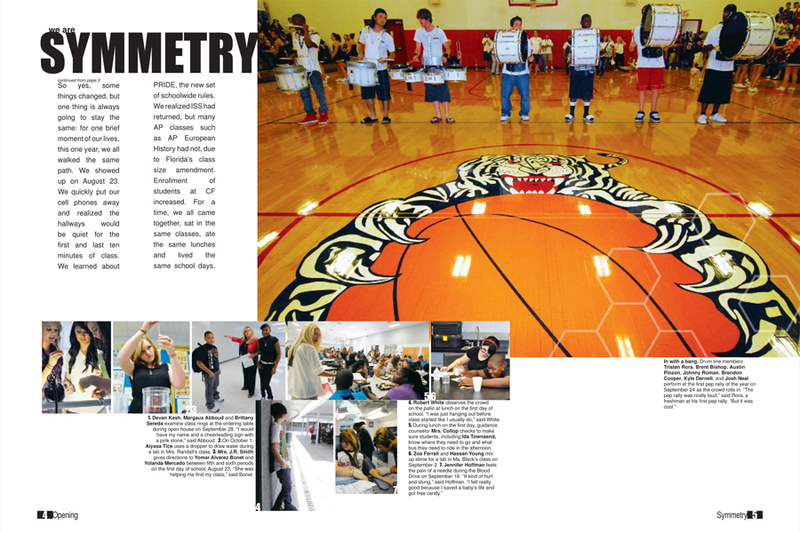 These pages were not winners when it came to design, but we sure managed to get a lot of people on them, and that’s what sells yearbooks. As our school grew, our coverage was not improving. Suddenly, we had over 1,000 students, but we were selling fewer books. It took time for me to change my opinion on how we should do things. But then I realized if we did not change, we would fail! My old opinion was that students should join clubs and plays sports. If they would only get involved, then they would get into those pages. My new opinion is that some students are not ever going to join anything at school, but we have to find a way to include them anyway. If we fail to include everyone, then how can we expect everyone to want a yearbook? How do you get everyone in the book? Well, trust me, there will be those who make a huge effort to remain anonymous. However, most students are just wishing your yearbook staff will make the effort. Even our opening pages had lots of people on them. So, I decided I would start blogging. I do like to write, but I’ve never been sure people would care what I have to say. Lately, I’ve felt the urge more than I have in the past. One would imagine that my focus would be on photography. I can’t guarantee that. I think I just need to write about whatever moves me at the time. I will tell you for certain that this will be about photography or something related at least half the time, but even though photography is my passion, I don’t ONLY get passionate about photography. So I may go on about other things. And you may or may not care. My only hope is that each time I put something on my blog that it will serve some purpose. Travel is just one of my passions. I believe that passion is absolutely necessary in life! 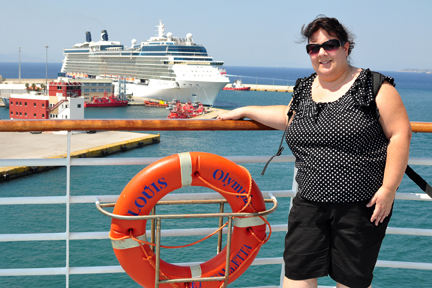 In Summer 2012, my son and I traveled to Greece. As many of you have heard, the economy there is very shaky. If you were to judge only by what you have seen on the evening news, you probably would choose not to go. Fortunately, I was able to see for myself that it’s not all what is on the news. Today, passion is the topic. The first thing is that you never know a person until you’ve walked a mile in his or her shoes. This is a theme in the book “To Kill a Mockingbird,” a favorite of mine. When somebody does something that I feel is just not right, I try to tell myself that I can’t understand him/her because I have not worn his or her shoes. Sometimes it works, sometimes it doesn’t. People sometimes astound me. What comes to mind right now is a student who admitted to me in front of the class this year that he never learned the words to the Pledge of Allegiance because he just never cared to learn it. It’s hard for me to understand that somebody could literally stand up and mumble something every day for 13 years, but not care enough about what he was saying to make some effort to know the words. My patriotism makes me literally stand at attention for the pledge every day, whether I am alone in my classroom, in the hallway, or in the front of the class. So strong is my desire to set an example and teach young people to appreciate what our country provides them, that I would have it no other way. And I do understand that these students have stood up and mumbled the Pledge every weekday of their lives, but could they not just every once in awhile pause to reflect on what the words really say, as they eye the remnants of their free or reduced breakfast that they picked up on the way to first period, and ready themselves to do as little as possible to take advantage of the free education that is provided them? The second conclusion is that there are not enough people today who have passion. After seeing these “Fish Doctor” places all over Greece, we decided to try our own fish pedicure in Heraklion. Yes, it’s kind of gross when you think about it, but the little fish eat the dead skin off of your feet. To me, passion is a strong feeling in your heart towards something. I easily have one main passion that anyone who knows me knows about. That is photography. I am also passionate about other aspects of what I do, basically the list of topics I might blog about. I LOVE PHOTOGRAPHY! I LOVE to TRAVEL! I LOVE EVERYTHING about YEARBOOK! I LOVE to COOK! I LOVE a well-designed magazine! I could literally shout these things from the rooftops. While skipping and singing. When we go on our adventures, we often take tours. 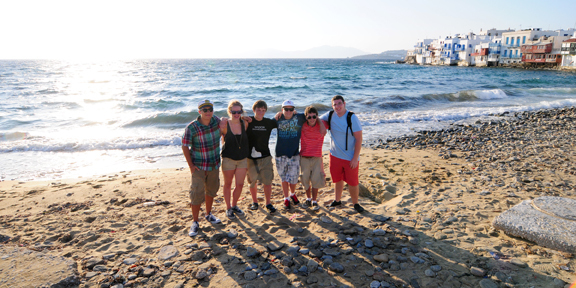 These students posing with my son (far left) in Mykonos were all part of an EF Tour to Greece (by land and by sea). Greece was my son’s high school graduation trip in the summer of 2012. Reflecting on my life as it is today, I could not imagine my life without these things, even though sometimes these things drive me crazy. (Again, looking at the list, some of the things drive me crazier than others, teens being one of them). I feel very strongly, passionately, that every person needs to have a passion. What is life without passion? A few years ago, a colleague and I taught the same subject across the hall from each other. Often, a student would fail her class and then, due to the way the schedule was set up, end up in my class for a second go at earning the credit. While we ate lunch, we often discussed these students. They were simply not passionate about school or English class, but almost all of them were passionate about something. We determined that if we were able to connect with these students through their passion, then they were more likely to pass our classes, hopefully the first time. I remember so many students who had a passion for music, and quite a few, boys especially, who were passionate about cars and fishing. It was always toughest when there was a challenging student who seemed to have no passion. I remember one of these, a young man. He just seemed so slimy. He was in my class after failing across the hall due to turning in a plagiarized research paper. Instead of learning his lesson, he turned in a plagiarized paper in my class as well. From what I could understand, there was no underlying issue at home to cause this young man to behave in such a sneaky way. In fact, I think his mother might have been a teacher. It was impossible for us to wear his shoes and understand his behavior towards our class and subject. It was down the hall in a different classroom that I saw this student in a new light. Somehow our principal was able to get Bo Diddley (the REAL Bo Diddley) to come visit our school. As scores of band students assembled in the bandroom to listen to him talk, Diddley first explained what he felt “real music” was as he showed off his handmade guitars. Then Diddley began to jam, and my student, who would not show an inch of personality or passion in my class, got up and joined in! Now granted, there were two who started jammin’ with Diddley, so I don’t know if he would have had the courage to get up there alone. Still, to join such a legend in an impromptu jam session is something that takes a lot of nerve. I’m sure that student did not earn a point more than was needed to pass my class, but I had a new respect for him once I understood his passion. Years later I ran into him on the Ocala Square on a Friday night. Turns out he was playing at one of the clubs and he invited me to see him. I went in and watched a set. I have long forgotten what instruments he played, but I hope that music is still a part of his life. And I sincerely hope that any of you out there who have not found or lost your passion in life, please go find it and pursue it. Passion is a requirement in order to lead a happy life. 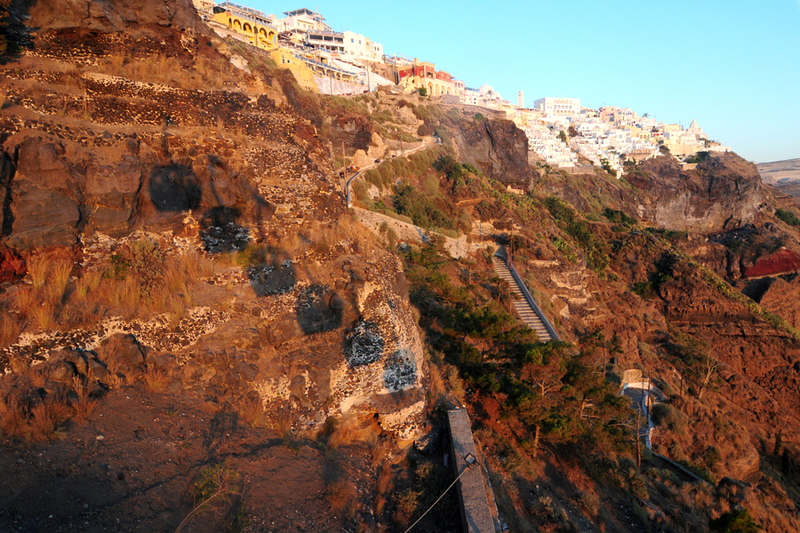 This is the Greek island of Santorini, which was created by a volcano. We did a hike on the other side of the island on black volcanic rock. Very cool. See the shadow on the rocks? We were actually on that ride at the time, on our way back down to the tender boats. 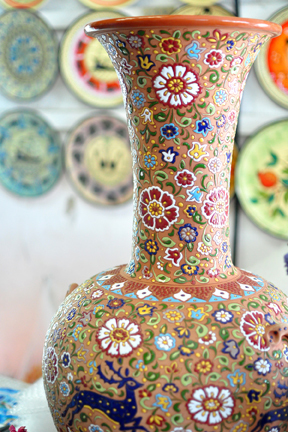 Greek pottery, very detailed and gorgeous!